" This is the nature of that country." "illimitably into the Mojave desert . . . . wait its occasions . . . . as one lover of it can." This classic volume of nature writing is a poignant description of Eastern California before the drainage and reclamation of the Owens Valley and Mono Lake. 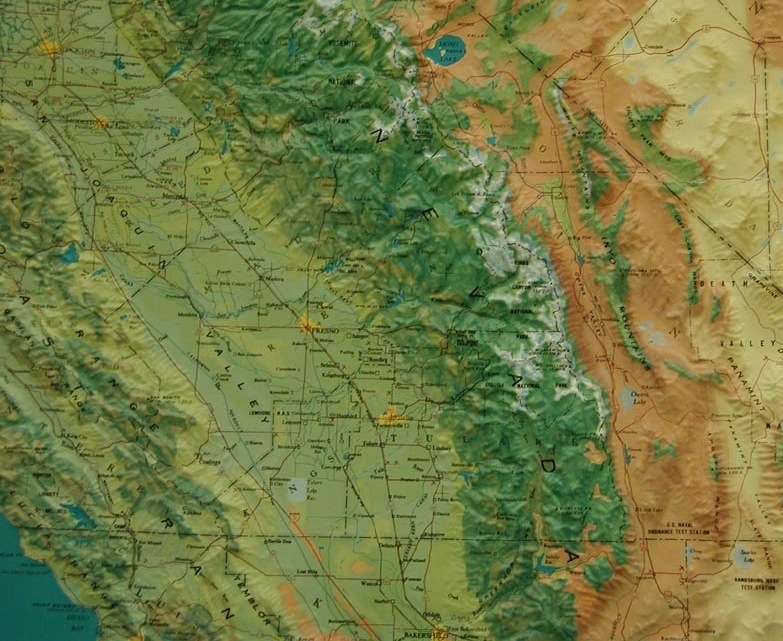 East of the Sierra Nevada Mountains is Mary Austin's well drawn sense of place. The reclamation of the Owens Valley to provide water for the City of Los Angeles to grow was begun surreptitiously in 1905 and was completed in 1913 with the construction of the Owen's Valley aqueduct built by the Los Angeles Department of Water and Power, the largest municipal utility in the nation. "Come away, you who are obsessed with your own importance in the scheme of things . . . ."
"all radiant with the color of romance." "This is the nature of that country." "where the mountains are steep and the rains are heavy, the pool is never quite dry, but dark and bitter, rimmed about with the efflorescence of alkaline deposits." "Since this is hill country one expects to find springs, but not to depend upon them, . . ."
"There are many areas in the desert where drinkable water lies within a few feet of the surface, indicated by the mesquite and the bunch grass. It is this nearness of unimagined help that makes the tragedy of desert deaths . . . .in a locality where shallow wells would have saved them." "Hot days the mules would go so mad for a drink that the clank of a water bucket set them into an uproar of hideous maimed noises and a tangle of harness chains . . . ."
"None other than this long brown land lays such a hold on the affections. The rainbow hills, the tender bluish mists, the luminous radiance of the spring, have the lotus charm. They trick the sense of time . . . . but men are bewitched by it and tempted to try the impossible." There are hills, rounded, blunt, burned, squeezed up out of chaos, chrome and vermillion painted, aspiring to the snow line. Between the hills lie high level-looking plains full of intolerable sun glare, or narrow valleys drowned in blue haze." 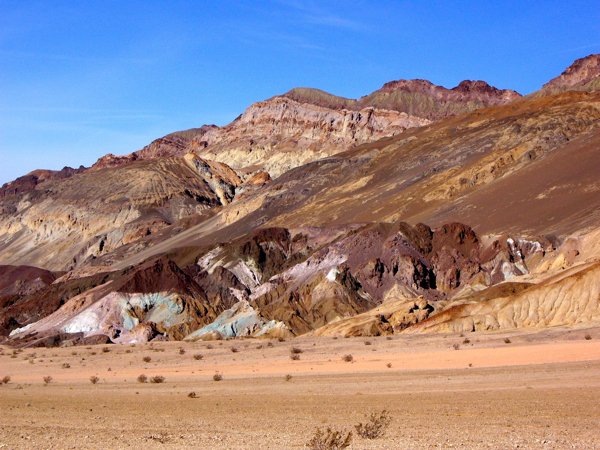 "Extreme aridity and and extreme altitude have the same dwarfing effect, so that we find in in the high Sierras and in Death Valley [above] related species in miniature that reach a comely growth in mean temperatures." 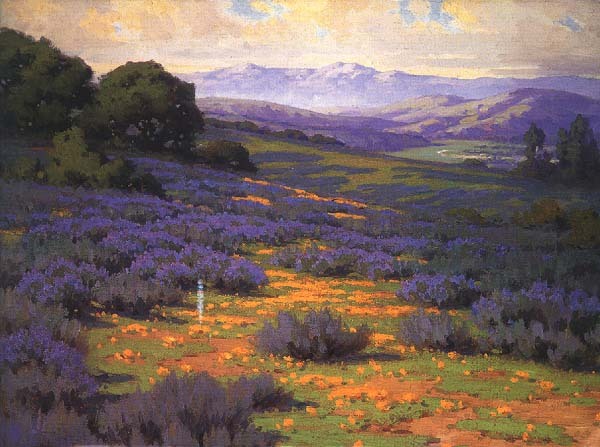 "In that country which begins at the foot of the Sierras and spreads out by less and less lofty hill ranges toward the Great Basin, it is possible to live with great zest , to have red blood and delicate joys, to pass and repass about one's daily performance an area that would make an Atlantic seaboard State, and that with no peril, and, according to our way of thought, no particular difficulty." "For all the toil that the desert takes of a man, it gives compensations, deep breaths, deep sleep and the communion of the stars. It comes upon one with new force in the pauses of the night. . . ."
"It is hard to escape a sense of mastery as the stars move in the wide clear heavens . . . "
"The increase in wild creatures is in proportion to the things they feed upon: the more carrion the more buzzards." "There is a place on Waban, south of White Mountain, where flat wind-tilted cedars make low tents and coves of shade and shelter, where the wild sheep winter in the snow." The luck of the prospector and the death, in a flood, of a settler. "According to the Pocket Hunter's account, he knew where he was, but couldn't exactly say. 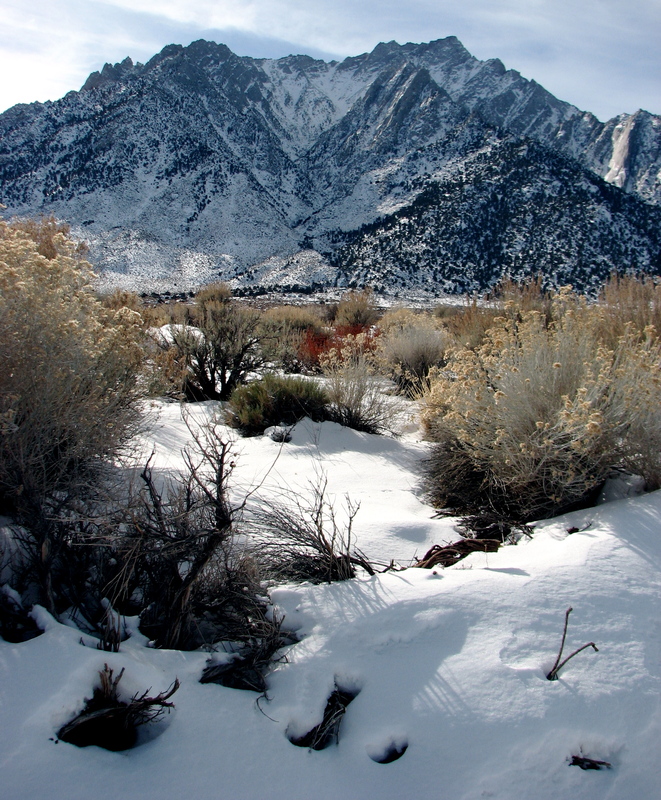 Three days before he had been in the west arm of Death Valley on a short water allowance, ankle deep in shifty sand; now he was on the rise of Waban, knee-deep in sudden snow, and in both cases he did the only allowable thing – he walked on." "The light broadened and the white pavilions of the snow swam in the heavenly blueness of the sea from which they rose." 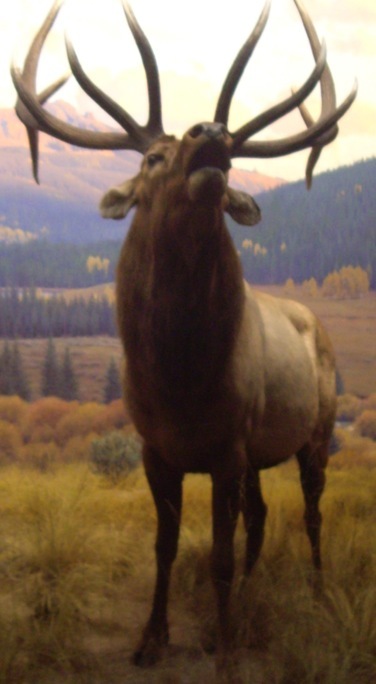 "It is the country of the bighorn, the wapiti, and the wolf, nesting place of buzzards, land of cloud-nourished trees and wild things that live without drink." "Gopherus agasizii, the turtle that by feeding on buds, going without drink, and burrowing in the sand through the winter contrives to live a known period of twenty-five years." "Any way you go at it, Jimville is about three days from anywhere in particular." ". 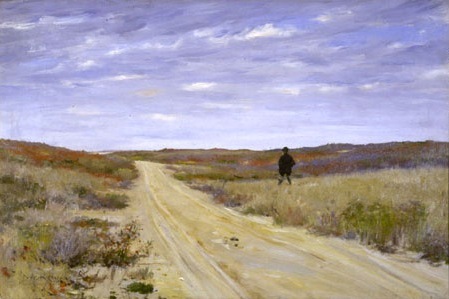 . . A stage journey of such interminable monotony – . . . . you cross lonely open land, with a hint in the sky of things going on under the horizon, a palpitant, white hot land where the wheels gird at the sand . . . – as induces forgetfulness of all previous states of existence." "The town looks to have spilled out of 'Squ – –' Gulch, and that in fact, is the sequence of its growth." The word above "'Squ - - " for the name of the Gulch is a , with a demeaning reference to women that we would consider profanity of the worst sort, so read it on page 40-41 and never use it in speaking or writing unless you want to offend Native People and Amerindian women. The story goes on to reveal on p. 41 how mistreated "Indian" women were by some of these prospectors. "Curiously, all this human occupancy of greed and mischief left no mark on the field, but the Indians did, and the unthinking sheep..
"It is a still field, this of my neighbor's, though so busy, and admirably compounded for variety and pleasantness, – a little sand, a little loam, a grassy plot, a stony rise or two, a full brown stream, a little touch of humanness, a footpath trodden out by moccasins." 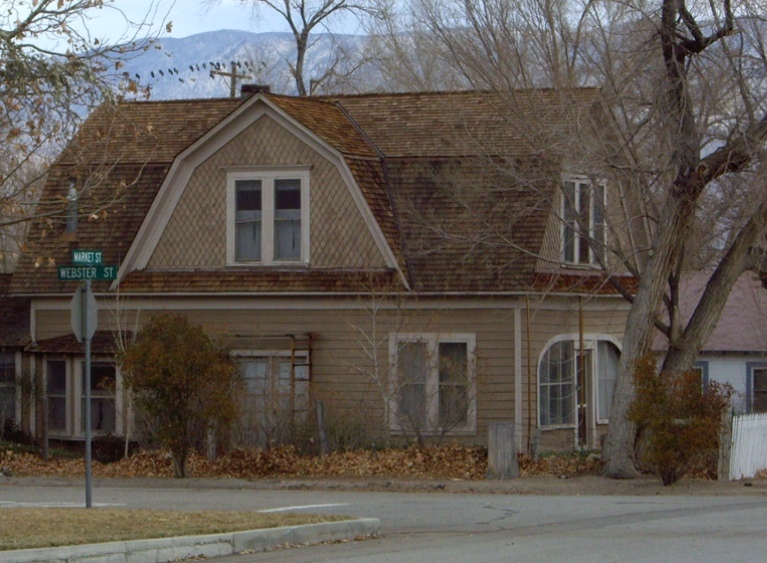 My neighbor "Naboth expects to make town lots of it and his fortune in one and the same day; . . . it occurs to me that though the field may serve a good turn in those days it will hardly be happier." "These are working hours, and all across the mesa one sees the women whisking seeds of chia into their spoon-shaped baskets, these emptied again into the huge conical carriers. supported on the shoulders by a leather band about the forehead." 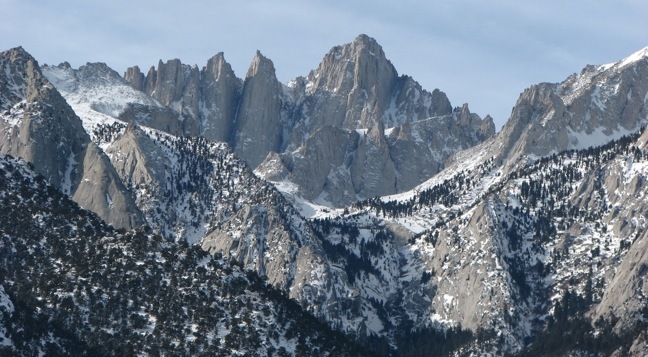 Mount Whitney, tallest peak in the lower forty-eight states estimated at between 14,497 to 14,505 feet in elevation. "One must learn to spare a little of the pang of inexpressible beauty." p. 53. "Seyavi's bowls (wicker basketry) are wonders of technical precision, inside and out, the palm finds no fault with them, but the subtlest appeal is in the sense that warns us of humanness in the way the design spreads into the flare of the bowl." "All the processes of life are carried on out of doors or behind the thin, twig-woven walls of the wickiup, and laughter is the only corrective for behavior." "So in her blanket Seyavi, sometime basket maker, sits by the unlit hearths of her tribe and digests her life, nourishing her spirit against the time of the spirit's need, for she knows in fact quite as much of these matters as you who have larger hope, though she has none but the certainty that having borne herself courageously to this end she will not be reborn a coyote." The Basket Maker, more to read about Seyavi. "All mountain streets have streams to thread them, or deep grooves where a stream might run." 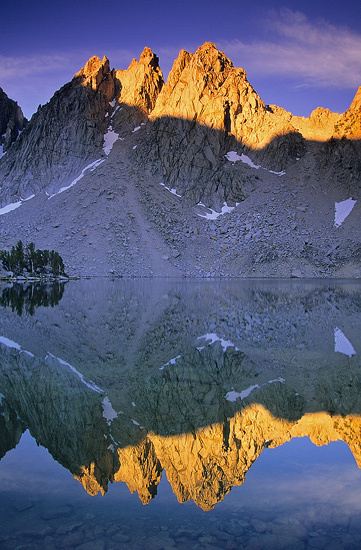 "Sitting islanded on some grey peak above the encompassing wood, the soul is lifted up to sing the Iliad of the pines. They have no voice but the wind, and no sound of them rises up to the high places. But the waters, the evidences of their power, that go down the steep and stony ways, outlets of ice-bordered pools, the young rivers swaying with the force of their running, they sing and shout and trumpet at the falls, and the noise of it far outreaches the forest spires...;and how the pine woods are made glad by them." "Who shall say what another will find most to his liking in the streets of the mountains. As for me, once set above the country of the silver firs, I must go on until I find white columbine. Around the amphitheaters of the lake regions and above them to the limits of the perennial drift they gather flock-wise in the splintered rock wastes. The crowds of them, the airy spread of sepals, the pale purity of the petal spurs, the quivering swing of bloom, obsesses the sense." "lip-lapping the great tideless lake, . . . the country of painted hills." (p25) --The Owens River in spring. "It is difficult to come into intimate relations with appropriated waters; like very busy people they have no time to reveal themselves." Tule is a grass, she suggests that these tules spread "Too slowly for counting they raise little islands from the bog and reclaim the land." "It always does rain somewhere among the peaks: the unusual thing is that one should escape it." "But the storms of hill countries have other business. They scoop watercourses, manure the pines, twist them to a finer fibre, fit the firs to be masts and spars, and, if you keep reasonably out of the track of their affairs, do you no harm." "Days when the hollows are steeped in a warm, winey flood the clouds came walking on the floor of heaven, flat and pearly grey beneath, rounded and pearly white above. They gather flock-wise, moving on the level currents that roll about the peaks, lock hands and settle with the cooler air, drawing a veil about those places where they do their work." 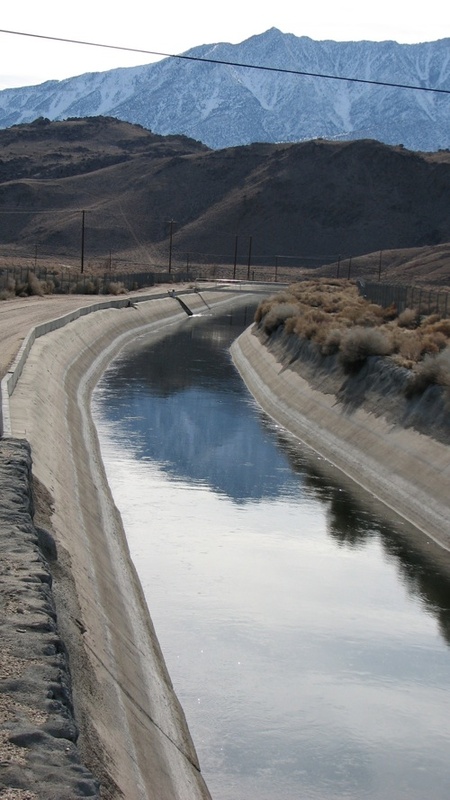 The Owens Valley aqueduct carries water from the Sierras across the deserts for over 300 kilometers or 266 miles from Mono Lake to Los Angeles County. "Sometimes one has the good fortune from a heather-grown headland to watch a rain cloud forming in mid air. Out over meadow or lake region begins a little darkling of the sky,–no cloud, no wind, just a smokiness as spirits materialize from in witch stories. It rays out and draws to it some floating films from secret cañons. Rain begins, 'slow dropping veil of thinnest lawn;' a wind comes up and drives the formless thing across a meadow, or a dull lake pitted by the glancing drops, dissolving as it drives. Such rains relieve like tears. The same season brings the rains that have work to do, ploughing storms that alter the face of things. These come with thunder and the play of live fire along the rocks. They come with great winds that try the pines for their work upon the seas and strike out the unfit. They shake down avalanches of splinters from sky-line pinnacles and raise up sudden floods like battle fronts in the cañons against towns, trees and boulders." 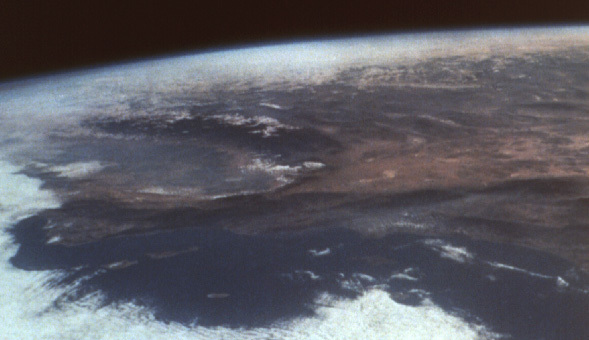 " All that storms do to the face of the earth you may read in geographies, but not what they do to our contemporaries. I remember one night of thunderous rain made unendurably mournful by the houseless cry of a cougar whose lair, and perhaps his family, had been buried under a slide of broken boulders on the slope of Kearsage. We had heard the heavy detonation of the slide about the hour of the alpenglow, a pale rosy interval in a darkling air, and judged he must have come from hunting to the ruined cliff and paced the night out before it, crying a very human woe. . . . In that same season of storms, a lake made milky white for days . . . with the trout floating in it belly up, stunned by the shock of the sudden flood." "What taxed me most in the wreck of my favorite cañons by cloud burst, was to see a bobcat mother mouthing her drowned kittens in the ruined lair built in the wash, far above the limit of accustomed waters, but not far enough for the unexpected. After a while you get the point of view of gods about these things to save you from being too pitiful." "This changing of the stream-tone following tardily the changes of the sun on melting snows is most meaningful of the wood notes. After it runs runs a little trumpeter wind to cry the wild creatures to their holes. Sometimes the warning hangs in the air for days with increasing stillness." The season changes and early snow "is wet and clogging, and makes white night of midday." "At Las Uvas every house is a piece of earth-- thick walled, whitewashed adobe that keeps the even temperature of a cave;..."
"Come away, you who are obsessed with your own importance in the scheme of things, and have got nothing you did not sweat for, come away by the brown valleys and full-blossomed hills to the even breathing days, to the kindliness, earthiness, ease of Pueblo de Las Uvas." palpitant, shaking, trembling, jerkily beating as in an irregular beating of the heart. 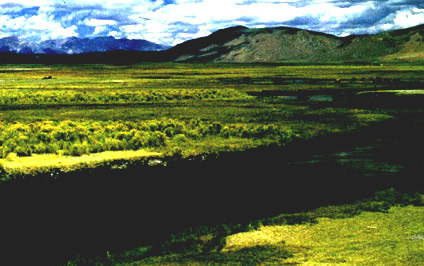 This trembling land suggested by Mary Austin in the phrase that follows palpitant, "white hot land."